Extremely proud about the launch of a new site, to launch Film4's latest release. 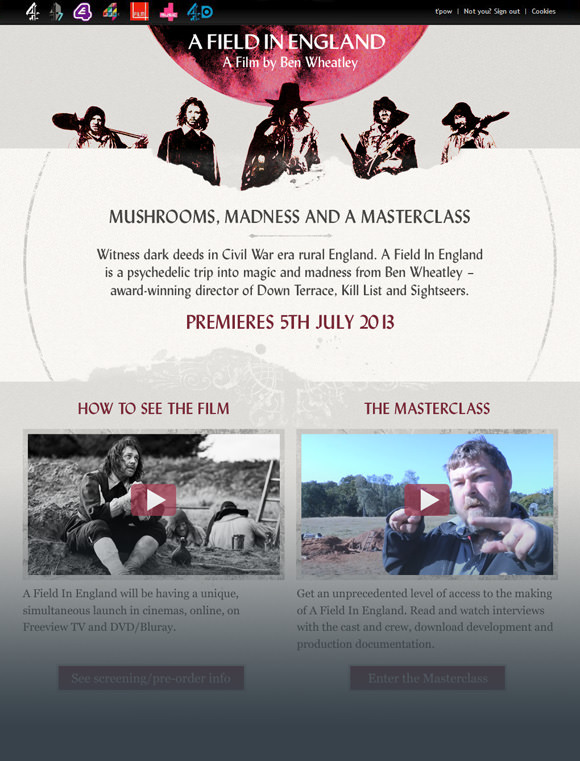 The site for the new Ben Wheatley film, A Field In England, accompanies an innovative release schedule that sees the film appearing simultaneously in cinemas, on Freeview, Video on Demand and DVD/Blu-ray. The site, for which I designed the overall structure, user experience and visual theme, gives a complete guide to the film-making process, from concept, right through to the film's launch and marketing. The design aimed to make the most of the fantastic promotional illustrations, created by Luke Insect Studio, while at the same time reflecting the film's aesthetic, and the civil war period where it is set.